Honeywell air purifiers are sold by Kaz, Inc., NOT Honeywell International, Inc., as is widely believed. 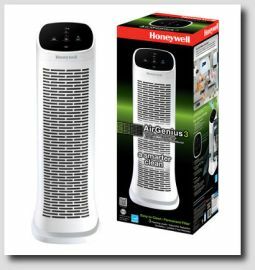 Perennial best-sellers in the entry-level under-$200 air purifier market segment, Honeywells are affordable air cleaners featured at big box retailers. Value, rather than technical sophistication or efficiency, is the sales proposition. Kaz acquired the Honeywell Home Environment business back in 2002, and sells "Honeywells" under a trademark licensing deal with Honeywell International. In 2011, the founder's heirs sold Kaz. Kaz, Inc. is now a wholly-owned subsidiary of Helen of Troy, Ltd., a personal care and housewares conglomerate. Based in Southborough, Massachusetts, Kaz, Inc, has sold many thousands of Honeywell air cleaners. Honeywell is the best selling brand in the air cleaner business, doing $400 million in sales in over 65 countries on six continents. Premium air purifier brands move much smaller unit volumes. Honeywells are particle-oriented, with little emphasis on controlling gas-phase pollutants and odors. They perform well when installed in properly sized room with no heavy odors or chemicals. Despite emphasizing the shortcomings of these offshore mass-produced air cleaners in my reviews, I consider the Honeywell air cleaners the best of the department store brands. Hunter, Bionaire, and Holmes, in my opinion, are less desirable than Honeywell. But thousands of buyers are confused and mislead by the marketing jargon and mislabeling of the all-seem-alike Honeywell air purifiers. So let's set things straight - know the facts before you buy. 3.) upstairs in a bedroom being remodeled, my 15-year old 50250. The most compelling reason to consider the Honeywell line is replacement filter availability. Buyers of the best-selling Honeywells need not fear being left with a serviceable air cleaner for which no replacement filters are marketed. You may see Honeywells with model suffixes ("50250-HD") including HD, CST, TGT, and SMS. These are exclusive marketing deals with big box retailers, Home Depot, Costco, Target, and Sam's. In this entry-level air cleaner market, unsophisticated buyers are fair game for marketing tricks. Kaz uses marketing labels that imply something the product is NOT; "Quietcare," "HEPAquiet." Kaz is NOT known for quality customer service - at these prices how could they be? When you buy an air purifier known for customer service, say a $330 Rabbit Air 421, I'm guessing 25% of the price goes to buy answer-on-one-ring service. Only if you never need customer service. For comparison, when buying a $228 Sharp Plasmacluster FP-A60U, a stronger air cleaner than the Rabbit, there is no premium for service, and little is provided. Honeywell warranties require users to pay shipping to Memphis, TN, and $10 for return shipping. For lower priced Honeywells, these costs can be enough to make buying a new air cleaner cheaper than pursuing the warranty claim. Over the years there have been hundreds of Honeywell models. Many discontinued models continue to sell due to inventory still in the distribution chain. In general, Honeywell air cleaners are NOISE prone. The motors and designs used are older technology. Just a little ways up the food chain there are air purifiers which are quieter than the Honeywells and do much more air cleaning for the sound emitted. Sharp Plasmacluster and Winix air cleaners, and others using 12 Volt BLDC motors, come to mind. Quality control in the offshore manufacturing plants is poor, so a certain percentage of units will have extra noise from out-of-round soft-plastic fans, soft plastic gears in oscillating bases, and motor bushings pressed improperly onto shafts. But others in the price class are worse. Few air cleaners at this level are made anywhere-but-China. Finding the right Honeywell model among so many products can be challenging. Here I offer capsule reviews of 17 current products. Where there is a full review, it is linked in the capsule. Let's narrow things down a bit. 1.) Do I need a more expensive true-HEPA filtered air cleaner? 2.) 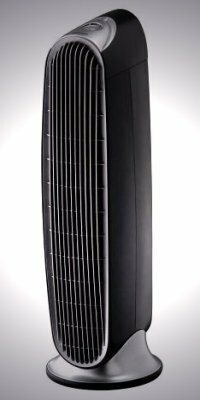 Is the Honeywell air cleaner under consideration real HEPA or HEPA-type? Marketing sleight of hand from Kaz, and from vendors and affiliates, clouds the issues. Perhaps the most common misrepresentation centers around the term "HEPA." Many buyers in this price class think they are getting true-HEPAs when they are not. "High Efficiency Particle Arrestance" (HEPA) is an Efficiency Standard for filters, it requires a percentage AND a particle size class. HEPA has NO bearing on chems/odors/VOCs. Real HEPAs capture 99.97% of .3 micron particles, AND a similar percentage of particles smaller than .3 microns. NOT "as small as .3 microns"
NOT "down to .3 microns"
and NOT ".3 microns and up." Note the position of the decimal point - three tenths of one micron. We are NOT talking about visible dust, as so many mistakenly believe they are buying an air cleaner to collect. A micron is .000039 inches, these particles are invisible to the naked eye. A single human hair is roughly 200 microns in diameter. High internal pressures, made possible by the gaskets, seals, and securing hardware needed to prevent these tiny particles from bypassing the true-HEPA, are what make true-HEPA machines noisy and expensive. Real HEPAs cost more for a reason. Several of the newer Honeywell air purifiers have 2.0 micron filters, offering far from real HEPA performance. But hundreds of user reviews report improved sleep and relief from stuffy noses when using the not-a-real-HEPA Honeywell air cleaners. Because a few key allergy triggers, like large dust, mold spores, and most pollen, are larger than 2.0 microns. Mold spores are 1 to 100 microns in size (most are between 3-20 microns), so many of those who have mold allergies can get relief with sub-HEPA air cleaning. Pollen grains run from 2.5 microns to 200 microns. The average allergy-triggering pollen is 25 microns, which is easily visible to the naked eye. So pollen allergy, which can be so devastating, may often be controlled by limiting pollen entry into the home (on shoes, hair, open doors and windows) and the purchase of a sub-HEPA air cleaner. 3.) electrostatic (IFD) filtered machines ("QuietClean" - HFD prefix). So, do you actually need a true-HEPA? Or might a less expensive Honeywell, hepa-type or IFD electronic filter, fit your situation? 1.) Some folks just want to reduce dust, have no allergies or pressing health issues, and want an economical air cleaner. This group could choose from any air purifier on the page, sized liberally. 2.) Others have large-particle allergies (mold, pollen) which might be helped by a Honeywell without HEPA. This group could try a less-expensive 2.0 micron model, put it in my recommended room size (NOT AHAM's) and move up to a true-HEPA in the future if necessary. 3.) Those with serious allergies, which generally involve smaller sub-micron particles, should consider true-HEPA models today, sized with CADR above room size. These will be LOUD on high speeds. Buyers of the non-HEPA models should know that fine dust will build-up inside the air cleaner. This should be cleaned out every 6 months or so, whenever an accumulation can be seen on surfaces inside the air cleaner. 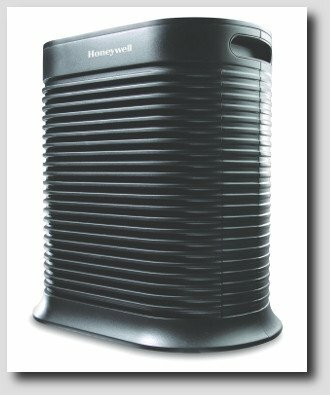 Honeywell's True-HEPA air purifiers have "long-lasting" HEPA filters, the "permanent" claim has largely been dropped, but may still appear on web sites. In the product briefs below, if the headline doesn't say "True-HEPA" the Honeywell has sub-HEPA performance. A starting point in every air purifier review should be checking CADR rates, although lack of CADR certification is common. Fortunately, Honeywell submits its entire product line to the Association of Home Appliance Manufacturers (AHAM) Clean Air Delivery Rate (CADR) particle testing program. CADRs are a very good tool for evaluating the power of a given Honeywell air purifier and comparing it against others. CADR ratings also include a maximum room size rating. But the AHAM room size rating is always too large. Unless you are sure you'll run your new Honeywell purifier on noisy high speed all the time, please consider my general rule: one square foot of room per average CADR number. So a "100 CADR" air cleaner (say 90 dust, 110 pollen, 100 smoke) would work best in a small 100 sq. ft. room. I can't repeat the CADR rule enough times: "Install your purifier in one square foot of living space per CADR rating." Seventeen Honeywell Air Cleaners are represented here in capsule reviews. Honeywells with a full review have links to the longer review. The list is roughly in order of market popularity. HHT-011 is Honeywell's best selling air cleaner. While this is a "permanent" 2.0 micron HEPA-Type filter, I like the HHT-011 better than competing products in the rock bottom price class. The chief competitor, at maybe two bucks less, Hamilton Beach 04383, is a 3.0 micron machine. AHAM room size is 85 sq. ft, HTT-011 will work better in very small rooms under 70 sq. ft.
Not an Energy Star air purifier. Honeywell HHT-011 is well sealed compared to other members of the under $100 price class. I use my HHT-011 in a supporting role, it runs alongside HEPAs, collecting dust that would fill their more expensive filters quickly. Honeywell 50250S is the latest designation in a long-running series of "50250" air purifiers. 50250 is Honeywells highest-powered true-HEPA air purifier, a very good value at around $140. The big round air cleaners once numbered maybe forty models, now there are just a few left. Official room size is 390 sq. ft., for best results install in 250 sq. ft. or less. This machine will clear a medium 160 sq. ft. room of particles quickly. Noise is the weak spot, with 35 decibels on low, 45 on middle, and an intrusive 57 dB(A) on high speed. Power consumption for each speed is 50 watts on low, 120 watts on medium, and 170 watts on high. This is NOT Energy Star frugality. Made in Mexico, rather than China. Economy, durability, and a strong Clean Air Delivery Rate (CADR) of 250 are some of the reasons for the continuing popularity of the 50250. One piece filters have been dropped, replacements are stacked three high. This insures long term replacement filter availability, but lets some air slip between the filters. Honeywell 50250-S Air Purifier is available at amazon.com. The new-in-2012 Airgenius line, (AirGenius5, AirGenius4, AirGenius3), is a revision of the long-established Honeywell HFD electronic grid with pretty tower styling. Quiet running and low-cost maintenance, consisting mostly of cleaning, are the AirGenius' selling points. Honeywell AirGenius4 and AirGenius5 are Honeywell-recommended and AHAM-verified for a max room size of 250 sq.ft. Air-purifier-power suggests a top room size of 170 sq. ft., assuming the filter is cleaned regularly. AirGenius3 is AHAM-verified for a room of 225 sq. ft. I like AirGenius3 for 160 sq. ft.
NOT for chemical sensitivity (MCS). 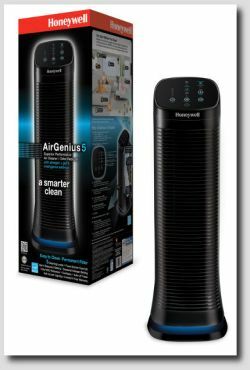 Honeywell AirGenius5 HFD320 at amazon.com. Honeywell AirGenius4 Air Cleaner/Odor Reducer, HFD310 at amazon.com. 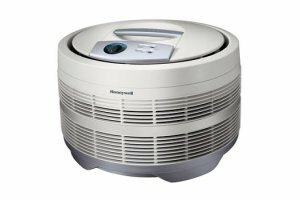 Honeywell AirGenius3 AirCleaner/Odor Reducer, HFD300 at amazon.com. Kaz calls HPA-300 their "Whole Room" Allergen Remover. And HPA-300 is a very strong air cleaner. AHAM Verifide Clean Air Delivery Rates (CADRs) are Smoke: 300 - Dust: 320 - and Pollen: 300. This power is said to provide five air changes per hour in a room size of 465 sq. ft.
Few users will tolerate the noise levels (Turbo speed used for testing) required to maintain clean air in that room size. I recommend 300 sq. ft. as a maximum room size for those seeking allergy relief or health benefits. In fairness, several user reviews say they notice "reduced dust levels" in rooms as large as 700 sq. ft.
You will see a prominent "top review site" saying HPA-300's strength is odor removal. Wrong, Honeywell HPA-300 is a good particle pollutant remover, equipped with the standard Kaz HRF-AP1 carbon prefilter for odors. This prefilter is a cheapened version of a long-running Honeywell brand odor/coarse dust prefilter, known for merely average performance verses light odors. Kaz still sells the older version, now called the "Premium" prefilter (HRF-APP1), which also fits HPA-300. Honeywell HPA-300 features True-HEPA filtration (99.97% of .3 micron size particulate). A while back, Kaz switched to a modular standard filter scheme, and HPA-300 uses three Honeywell HRF-R1 filters stacked into its bay. Replacing 3 HEPAs annually and prefilters quarterly yields a yearly filter cost of over $100. Controls are easy one-tap electronics, but HPA-300 has no air-quality sensors or automatic operation. Users manually select one of four speeds. A timer shuts down the purifier after 2, 4, or 8 hours. Honeywell HPA-300 is a good seller, accumulating 51 buyer reviews at Amazon, averaging 4.1 stars. Consumer Reports, which weighs AHAM style particle tests very heavily, gave HPA-300 high rankings. HPA-300 measures 20" wide, 11" deep, and 23" high, and weighs 16.8 lbs, not small, but few 300 CADR purifiers are smaller. This machine is EPA ENERGY STAR® qualified, frugal on electricity use for the power. Buyer reviews rate the noise levels acceptable, noting that Turbo is quite loud. This is a 120V AC motor, always louder than more modern 12V BLDC (Brushless Direct Current) designs found in some competing models. HPA-300 is 'Ozone Free' and has no ionizer. A couple user reviews mention break-in odors from new plastic parts. HPA300 intakes air from the front and exhausts it up, allowing placement closer to walls or furniture than rear/side exhaust models. There is one design defect that draws almost universal buyer disdain: front panels with defective press-in release locks. It is important to read the user manual and be careful when handling the front panel, users who rely on intuition will often damage this "door." Many report that using tape or Velcros to secure the panel solves the problem. In the photo above, note how the 3 HEPAs and black carbon prefilter fit somewhat loosely. I recommend sealing the prefilter edges with tape, to prevent bigger dust from prematurely clogging the pricey HEPAs, rather than relying on the front cover to hold the filter train securely. This makes the "weak locks" issue somewhat superficial. Honeywell HPA-300 True HEPA Allergen Remover at Sylvane.com. Honeywell HPA-300 True HEPA Allergen Remover at Amazon.com. HPA-200 is the mid-sized member of the Honeywell console-styled HPA series. Kaz calls it the "Large Room" Allergen Remover. With AHAM Verifide Clean Air Delivery Rates (CADRs) at Smoke: 200 - Dust: 190 - and Pollen: 180, HPA-200 is a mid-powered air cleaner. HPA-200 is claimed to produce five air changes per hour in a 310 sq. ft. room. Buyers should be aware that these performance claims are based on continuous (loud) operation, an unlikely scenario. Folks seeking allergy relief or health benefits should select HPA-200 for rooms 200 sq. ft. or smaller. HPA-200 sells a bit slower than its bigger sibling HPA-300, but 17 Amazon.com buyer reviews average a strong 4.4 stars. Honeywell HPA-200 is a particle focused machine, odor removal is done by the standard Kaz HRF-AP1 carbon prefilter. Kaz also offers the "Premium" prefilter (HRF-APP1), which also fits HPA-200. Users must cut prefilters down to size to fit HPA-200. Honeywell HPA-200 has two 99.97% at .3 micron True-HEPA Honeywell HRF-R1 filters. Replacing 2 HEPAs annually and prefilters quarterly yields a yearly filter cost of about $75. One-tap buttons allow users to manually choose among four fan speeds. HPA-200 has a timer that operates the purifier for 2, 4, or 8 hours before shutting down. HPA-200 measures 18" wide, 10" deep, and 19" high, and weighs 14 lbs. Buyer reviews rate the noise levels acceptable, but not quiet. Shoppers wanting the quietest air purifiers should seek 12V BLDC (Brushless Direct Current) motors, HPA-200 has a 120V AC motor. HPA-200's display can be dimmed or turned off for night time use. HPA-200 is 'Ozone Free' and has no ionizer. Some buyer reviews speak of short lasting break-in odors from new HPA-200s and replacement filters. HPA200 blows air upwards, so it can sit fairly close to walls. The HPA series is known for weak front panels, but HPA-200s, with a smaller panel, draw fewer gripes than HPA-300. But, again, I suggest sealing and securing the cut-down prefilter edges with tape. Honeywell HPA-200 True HEPA Allergen Remover at Sylvane.com. Honeywell HPA-200 True HEPA Allergen Remover at Amazon.com. Honeywell's console-styled HPA series has three models - HPA-300, HPA-200, and HPA-100. HPA-100 is the smallest model of the Honeywell HPA series. HPA-100 is a low-powered air cleaner, with AHAM Verifide Clean Air Delivery Rates (CADRs) at only 100 Smoke, 100 Dust, and 100 Pollen. Honeywell's HPA-100 is said to deliver five air changes per hour in a 155 sq.ft. "medium sized" room. This is far too much air for this small air purifier to clean. For expected health benefits in all but the tiniest spaces, buyers should choose something stronger, like the HPA-200 or HPA-300, both above. I recommend HPA-100 only for office cubicles, dorm rooms, hallways, and other confined spaces. That said, several user reviews report acceptable results with cat litter odors in small spaces with extra carbon and frequent carbon filter changes. HPA-100 sells much slower than its bigger sibling HPA-300, but 28 Amazon.com buyer reviews average 4 stars. Honeywell HPA-100 ships with the standard Honeywell HRF-AP1 'A' odor reducing cut-to-fit carbon prefilter. Also sold is the "Premium" prefilter (HRF-APP1), which users also cut to fit HPA-100. Users with odor issues may need to use the heavier prefilter, and/or double the thickness. One Honeywell HRF-R1 True-HEPA (99.97% efficiency at .3 micron) "R" filter, significantly smaller than the space that could have been available with this chassis, fits inside HPA-100. Replacing 1 HEPA annually and prefilters quarterly yields a yearly filter cost of about $40. One-tap buttons allow selection of one of four speeds. The speed names "General Cleaning," "Allergen," and "Germ," are chosen to fool the first-time purifier buyer, there is NO UV or bactericidal "germ" filter on HPA-100. Well, at least "Turbo" is unambiguous. A timer runs the air cleaner for 2, 4, or 8 hours before turning off the HPA-100. HPA-100 measures 14" wide, 9" deep, and 14" high, and is lightweight and reasonably portable. HPA-100 has a 120V AC motor, which makes relatively more noise than competitors equipped with 12V Brushless Direct Current motors. Energy Star-Qualified, HAP100 features a dim-able control panel with a dark setting. HPA-100 is not an ionizer and produces very little ozone. Chemically sensitive buyers will notice some plastic out-gassing from new HPA-100s and from new replacement filters. HPA100's upward exhaust means it need not be positioned far from objects or walls. HPA-100, like its bigger brothers, has a poorly secured front cover. As above, I recommend using tape to secure and seal the filter train and cover. Honeywell HPA-100 True HEPA Allergen Remover at Sylvane.com. Honeywell HPA-100 True HEPA Allergen Remover at Amazon.com. HFD-010	is a very compact desktop air cleaner, the smallest of the HFD series. This little electronic machine is a best seller, with over 300 amazon buyer reviews averaging "four stars." Two air cleaning speeds drive air through electronic IFD filters. Advertised room size is 62 sq. ft. Since there are few rooms this small, HFD-010 could be used in office cubicles or other confined spaces. Many are attracted to the IFD design because there are no filters to buy. Washable electronic filters are just that, washable, over and over again, at least once a month (pets and smokers...weekly at most), to keep it working. HFD filters make some ozone, easily within official Air Resources Board limits, not suited for asthmatics and the chronically ill.
HFD-010 is bit more expensive than filtered Honeywells with similar strength. Honeywell HFD-120-q, with a "permanent" electrostatic IFD filter wrapped in a sleek attractive black and chrome tower, holds amazon.com's number five sales rank in air cleaners. HFD-120-Q is another implementation of the IFD electrostatic filter. Honeywell's version of the permanent washable IFD filters collect particles 2.0 microns and larger. HFD-120-q uses 2 IFD filters, which save money by being washed or vacuumed when dust accumulates. The marketing room size is 170 square feet. A realistic room size is 110 sq. ft. This air purifier eats just 43 Watts on high, an EPA Energy Star. Light ozone emissions are a no-no for asthmatics. HFD's are quiet and economical, and do help mold/pollen allergy. 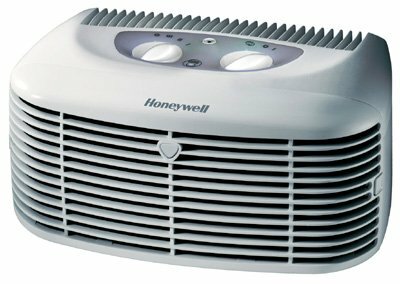 16200 is a desktop compact air cleaner very similar to Honeywell HHT-011 (above), but with a different, replaceable, filter. Since the "permanent" filtered HHT-011 was introduced, with marketing fooling many into thinking it contained a true-HEPA, sales of the predecessor Honeywell 16200 have fallen as HHT-011 ran to the top. Really they are almost the same air cleaner. Vendor/AHAM room size is 80 sq. ft., I like it for a small room or cubicle to 55 sq. ft.
Filter captures 95% of 2.0 micron particles that pass through it - not HEPA. No Energy Star, using 44 Watts on high. 50150 is a smaller brother to, and is overshadowed by, 50250 (above). Another survivor of the old 14-inch round group. It uses two of the stacking filters instead of three as in 50250. AHAM recommended rooms are way too big at 235 sq.ft. To do any real good, I'd put this 14-inch round Honeywell in 150 sq. ft. maximum room size. Good air cleaner, but noise-to-cleaning ratio is high. 17000S is another survivor of the round-filtered Honeywell designs, this one with the filter laid in sideways. Honeywell 17000 air cleaners use two modular HRF-D1 stacking replacement filters. Official room size is 200 sq. ft., nothing about this air cleaner (no plasma ion streamer or photocatalytic oxidation...) to suggest more than 1.0 sq. ft. per smoke CADR, so I think 130 sq. ft. is best room size. Kaz has called this true-HEPA "Permanent, needing only periodic vacuuming to last indefinitely. I have been skeptical of these claims. 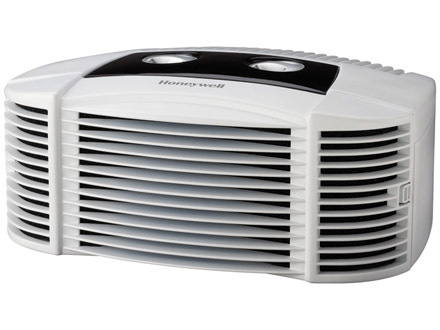 Not an Energy Star, but Honeywell 17000 is as inexpensive as a true-HEPA air purifier can be. 17005 is essentially the same as 17000 above, but with a different electronic interface which includes a remote control. 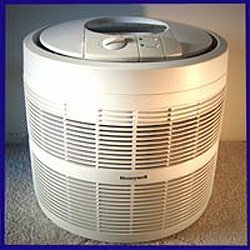 Honeywell HHT-081 "HEPAClean" Tower Air Purifier with Permanent Filter. Note that "HEPAClean" means NOT-HEPA. This is another 2.0 micron hepa-type filter. But HHT-081 is stronger than top seller HHT-011. HHT-081 is sold as suitable for rooms to 170 sq. ft., I like 100 sq. ft.
HHT-145 is a fancier "Permanent HEPAclean" with a UV lamp, cool looks, oscillation feature, and electronic controls. Trouble-prone oscillation adds nothing to air cleaning capacity, but makes a good fan. Suggested retail of $269.99 is big money for a 2.0 micron hepa-type filter. HPA-150 has True-HEPA and carbon pre-filter for odors. Uses two HRF-H1 filters stacked vertically. Room size is quoted at 177 sq. ft., but 120 sq. ft. is a realistic room. HPA-150 is Energy Star certified. HPA-050 is basically the HPA-150 sawed in half, using just one HRF-H1 filter. This one fits a 65 sq. ft. room. This small Honeywell seems to have a few reviews citing excessive noise. The twice-as-strong HPA-150 (above), at only 150% of the HPA-050's price, seems a better value. HHT-090 is a "HEPAclean" hepa-type air cleaner, again widely misrepresented - it uses Honeywell HRF-C1 filters (95% at 2.0 microns) NOT HEPA. AHAM recommended room is 170 sq. ft., 100 sq. ft. will give much better air quality. HFD-110 is a 2.0 micron electronic (IFD) filtered tower. Vendor recommended room size is 124 square feet. Because the IFD filtered air purifier makes less noise, and lets the air cleaner run on higher speeds without annoyance, I rate these electronic air cleaners slightly above 1.0 square foot/CADR ratio. How about 90 sq. ft. for the HFD-110. Ozone under Federal guidelines is still too high for asthma and severe allergy folks. 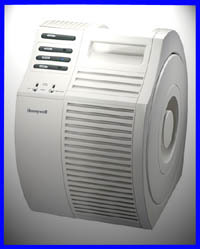 Honeywell HHT-080 HEPAClean Tower Air Purifier is a 2.0 micron hepa-type machine. Note the strong similarity to HHT-080, above. HHT-080 is AHAM-rated for rooms to 170 sq. ft., 100 sq. ft. is my recommendation. Honeywell HHT-013 is the same as the best selling HHT-011, with a souped-up Carbon and Zeolite pre-filter for a little extra odor adsorbtion. HHT-013 uses the HRF-CP2 replacement filter set, with one hepa-type and two odor prefilters. Pet owners should expect to buy quite a few sets. AHAM's recommended room is 85 sq. ft, HTT-013 will deal with pet odor better in very small rooms under 60 sq. ft.
18155 is recently discontinued, but still actively distributed. I call the 18155 "Honeywells 14-inch noise reduction experiment." 18155 uses the 14-inch round filter, but with redirected airflow to lower sound emissions. User reviews say the experiment was only partly successful, that 18155 is quieter than other Honeywell HEPAs but still too noisy for the bedroom. AHAM rated for 197 sq. ft., I like it better in 144 sq. ft.
No Energy Star for Honeywell 18155, at 90 Watts on high and 45 Watts on low.